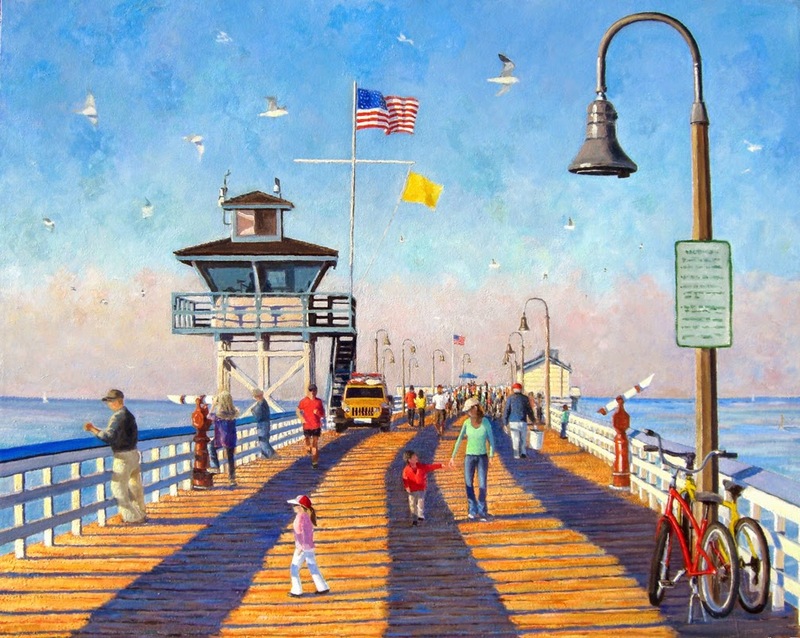 Artist Paul Gavin's "Morning Colors: San Clemente Pier Walk" Oil on Canvas is featured on the 2014 City of San Clemente Recreation Magazine. Along with regular morning pier activities this painting captures the three stripes down the pier phenomenon. For only a few weeks in the winter the sun rising directly perpendicular to the pier creates long and wide shadows of the three piece railing all across the pier down its entire length. The colors of both the shadows are and the pier are truly 'fleeting". Not only do they change every day depending upon the moisture in the air and the dampness of the pier but they also vary by the minute throughout each sunrise with the changing angle of the sun. Not yet even on the web site the giclee's will be available soon. The image measures 24" x 30" and the giclee's will be available soon. Are you interested? Email us for more information.